The blue plasma is evident in this picture. Note the clear sky and stars above and to the left of this supercell. Astronomy Magazine's online picture of the day. Crepuscular rays from the “harvest” moon, September 17, 2005. Eos 20-D. 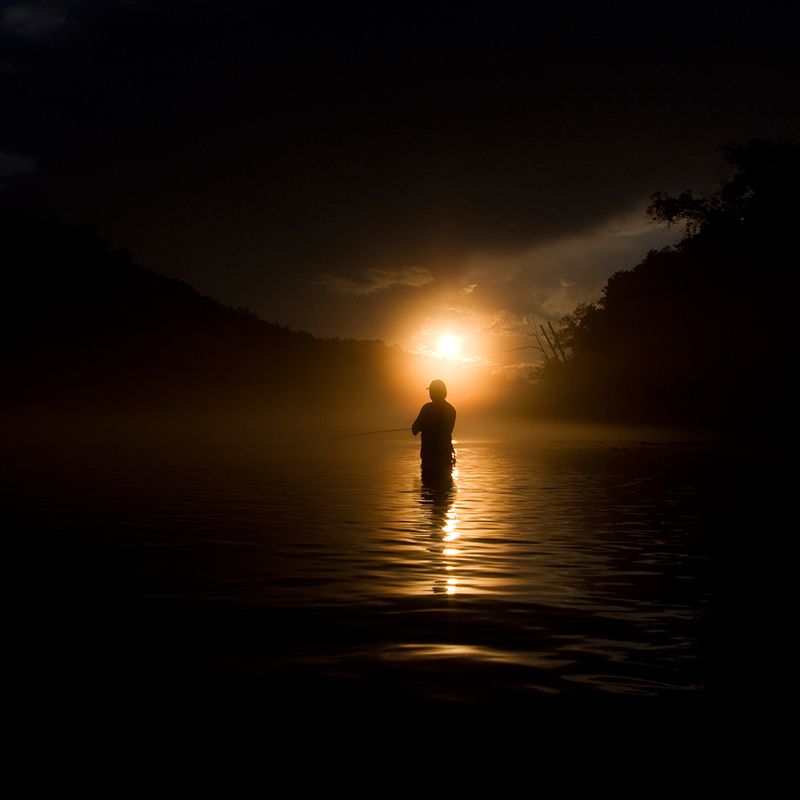 These rays usually appear to emanate from the sun, and radiate down through gaps in clouds. 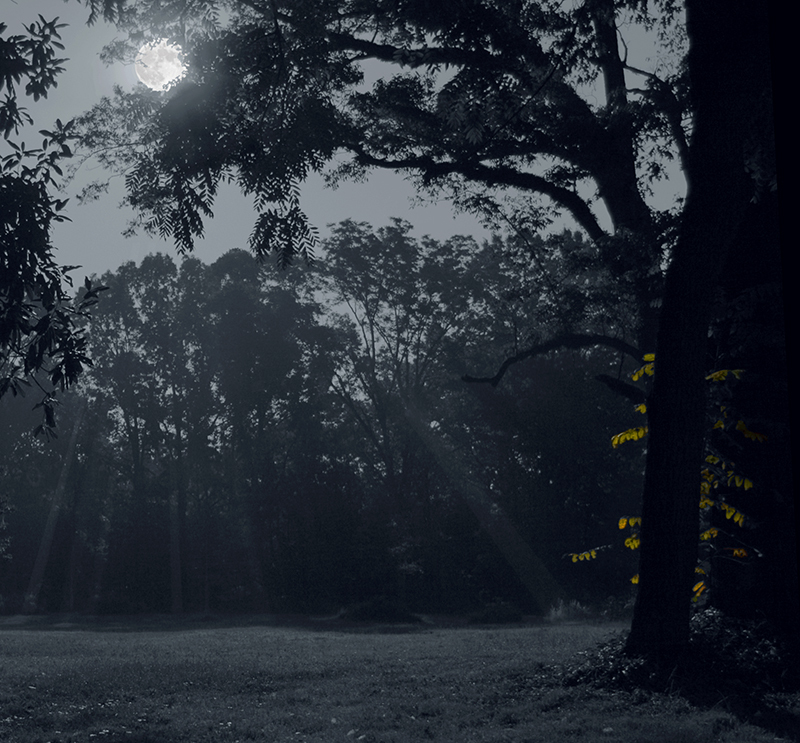 In this case, the sunlight is bouncing off the moon, and the cloud is in the form of a nighttime fog. 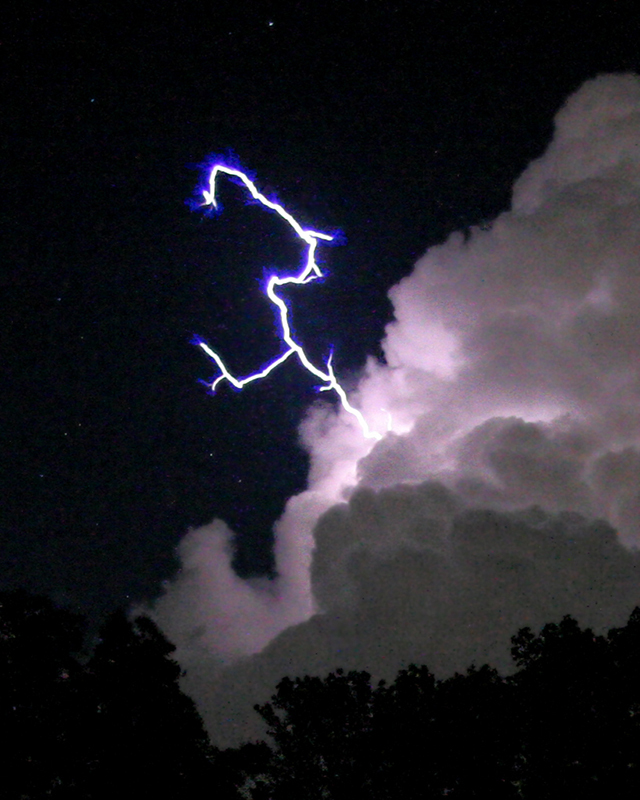 Thunderstorms at high altitude are often quite violent. Within a few minutes, the sun was blazing and this dazzling set of rainbows appeared. 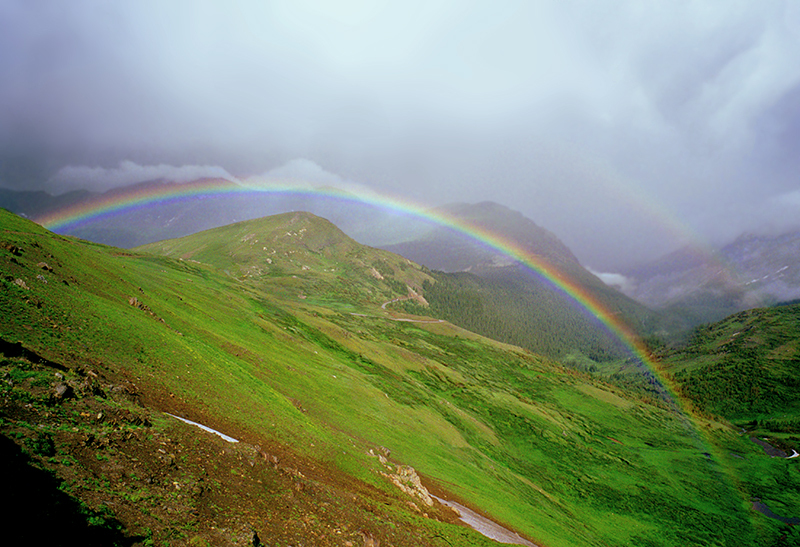 The picture nicely shows the color inversion that occurs when a second rainbow is present. 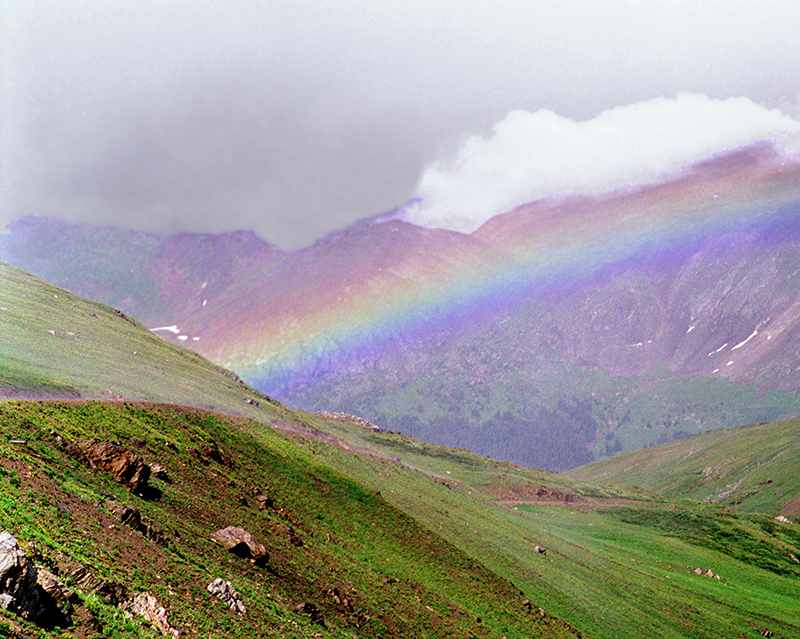 The reversal of colors results from light bouncing twice through the prismatic water droplets. 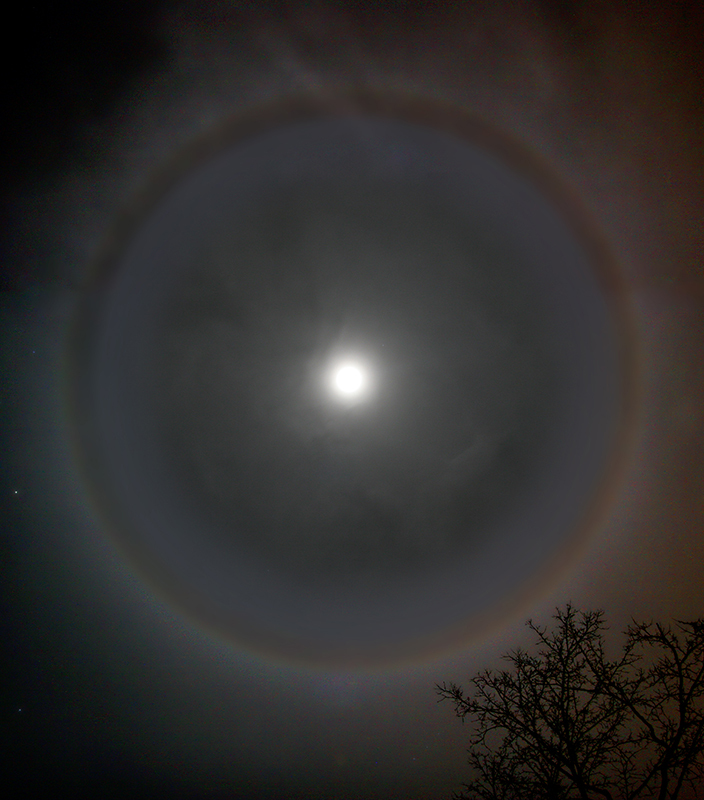 Also known as a moon ring or winter halo. It encircles the moon at a 22-degree separation, dictated by the prismatic effect of hexagonal ice crystals in very high cirrus clouds. Canon Eos 20-D, 20mm lens. Mosaic of two pictures to capture the full halo, with a third exposure for central cloud detail. Published in Astronomy magazine, May 2005 and February 2006. Note the difference between this and a lunar halo. Coronas are caused by diffusion of light by water vapor, not ice crystals. “Sundogs, also known as mock suns or parhelia, form as sunlight is refracted by hexagonal plate-like ice crystals with diameters larger than 30 micrometers and their flat faces horizontally oriented. They are visible when the sun is near the horizon and on the same horizontal plane as the observer and the ice crystals. As sunlight passes through the ice crystals, it is bent by 22 degrees before reaching our eyes, much like what happens with 22 degree halos. This bending of light results in the formation of a sundog. The difference between sundogs and halos is the preferential orientation of the ice crystals through which the light passes before reaching our eyes. If the hexagonal crystals are oriented with their flat faces horizontal, a sundog is observed. If the hexagonal crystals are randomly oriented, a halo is observed.” Department of Atmospheric Sciences, the University of Illinois at Urbana-Champaign. 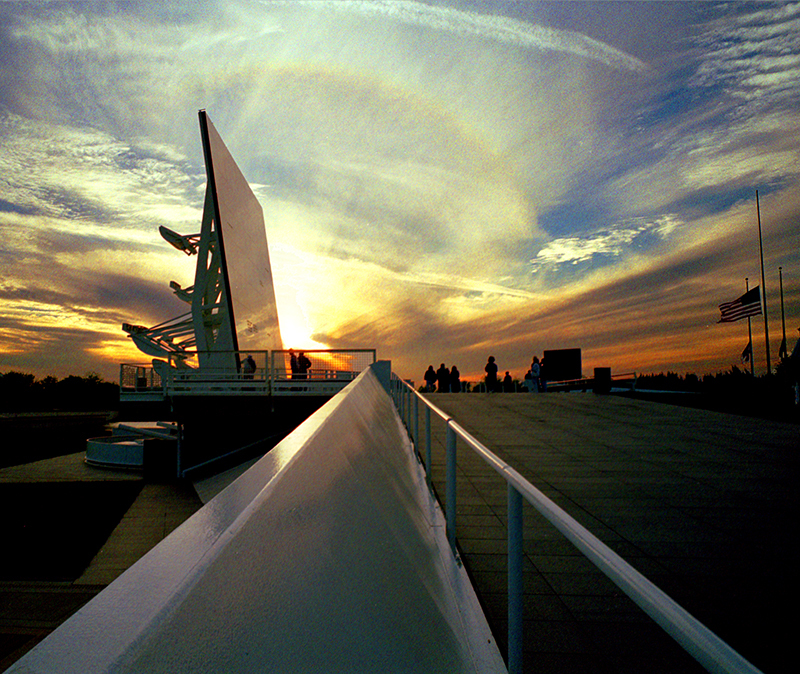 Solar (and lunar) halos are caused by refraction of sunlight through six-sided ice crystals in high clouds. The halo forms at a 22-degree radius around the Sun. 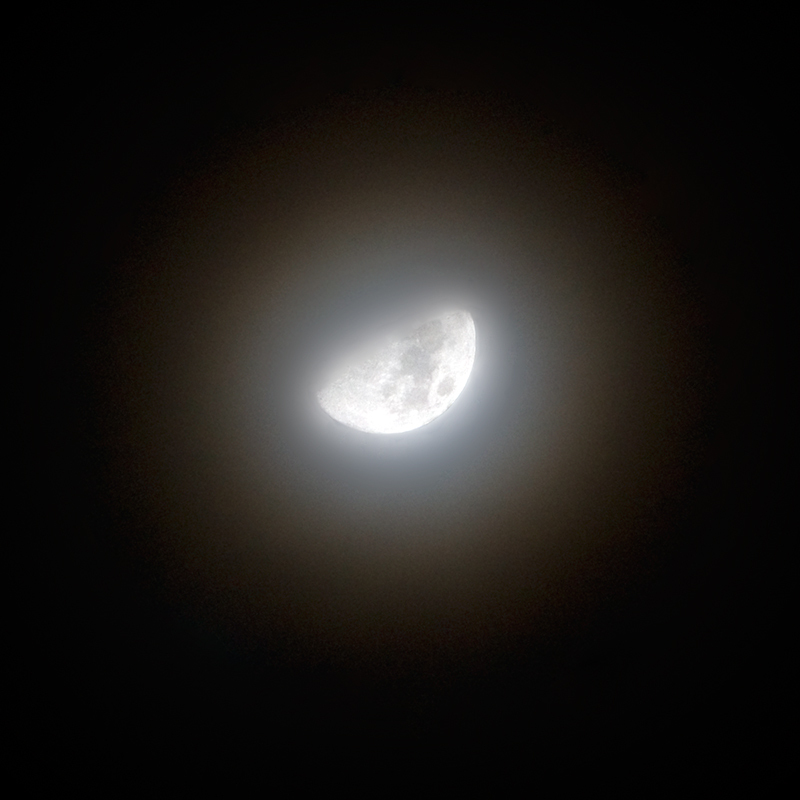 The colors can be rather muted, especially with lunar halos. Red is always on the inside because of differential refraction.